Living and eating well on a budget. This is the filling I use for my lentil lasagne. It also works very well as a filling for suet pasties a la Mortgage Free in Three, though the white sauce requirements are very different. This will make enough for 6-8, so I tend to use 2/3 for lasagne and the rest for pasties. You will also need lasagne sheets if you are making lasagne, or self raising flour, salt, butter, suet, water and egg if you are making the pasties. Warning – suet pastry is hard work to roll out…. 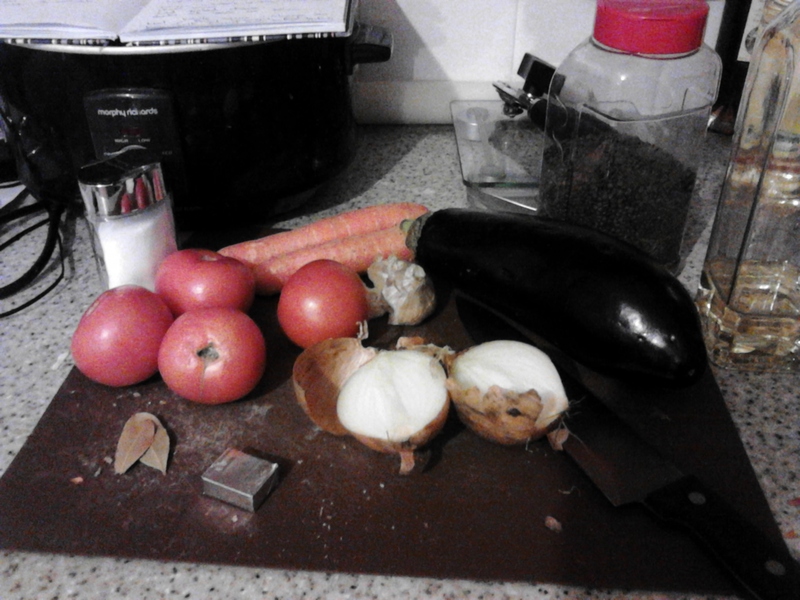 Chop the onions, carrot, mushrooms and/or aubergine. You want the bits to all be roughly the same size…. 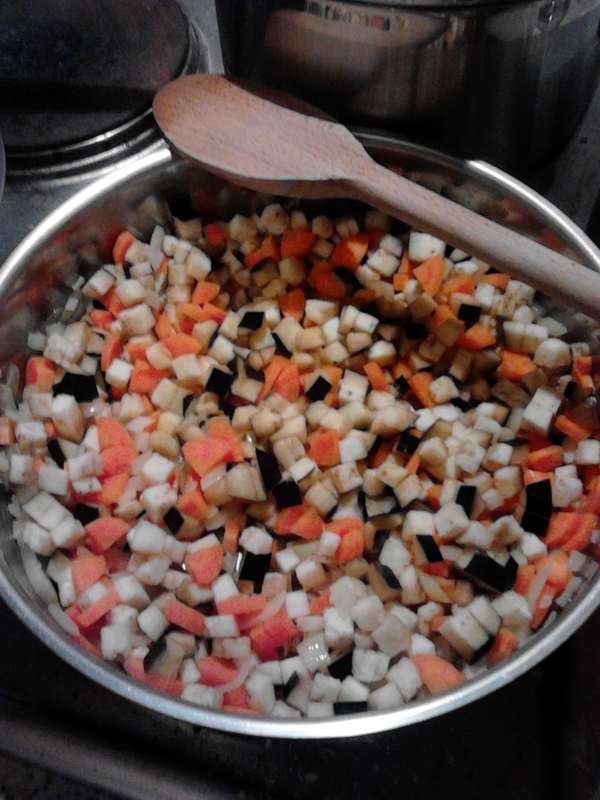 Fry onion, carrot, mushrooms and/or aubergine together in a little oil until they are soft. Aubergine is notoriously thirsty for oil, but if it starts looking dry don’t add more oil, just add a little water and put the lid on. You’ll find it will soften beautifully without sticking or burning. Chop or crush the garlic, and add that and lentils to your pan and mix well. 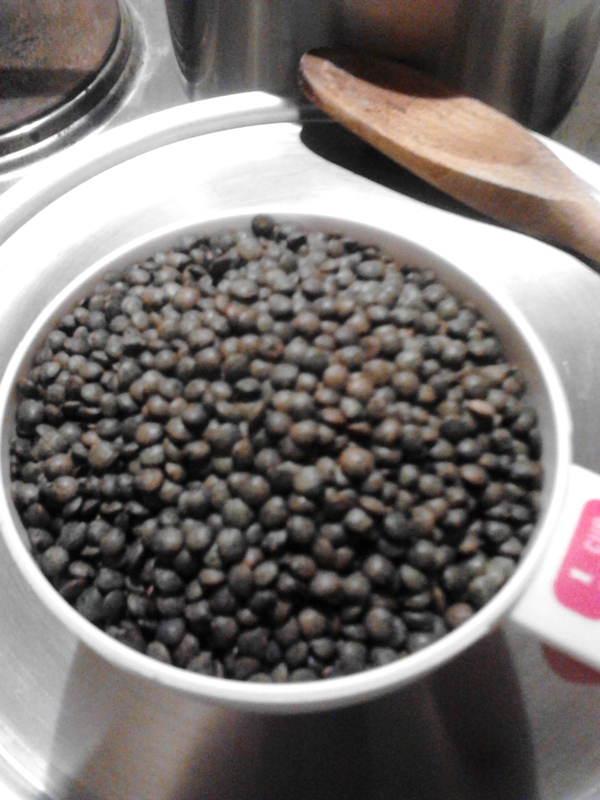 This is what puy lentils look like, for those who were asking. You can get tiny black ones called beluga lentils, which make the filling look even more like beef lasagne – they are really posh but they Co-Op sometimes stocks them. 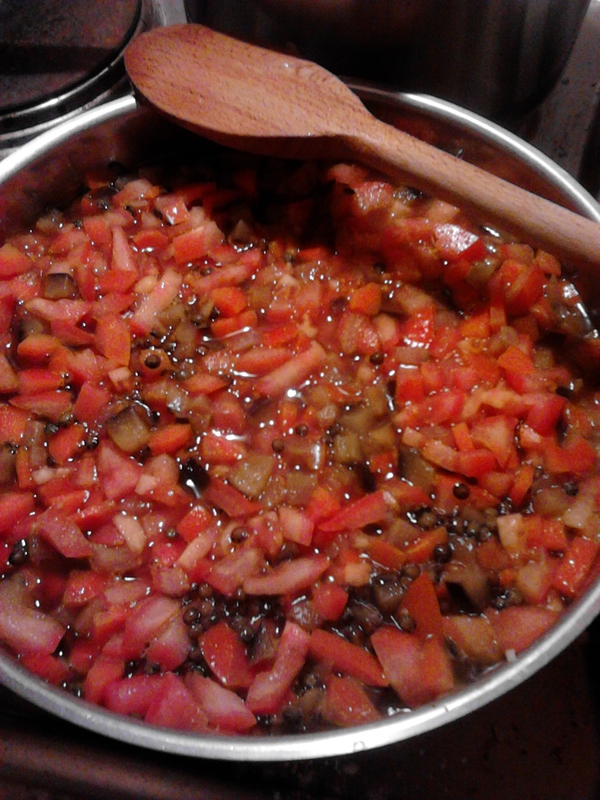 Add stock, chopped tomatoes and bay leaves, mix well and bring to the boil. If you’re using tinned tomatoes, I find the whole ones are tastier, and just chop them in the tin with scissors before dumping them in the pan. In this case, I had some ‘salad’ tomatoes that had refused to ripen fully so used them up instead. 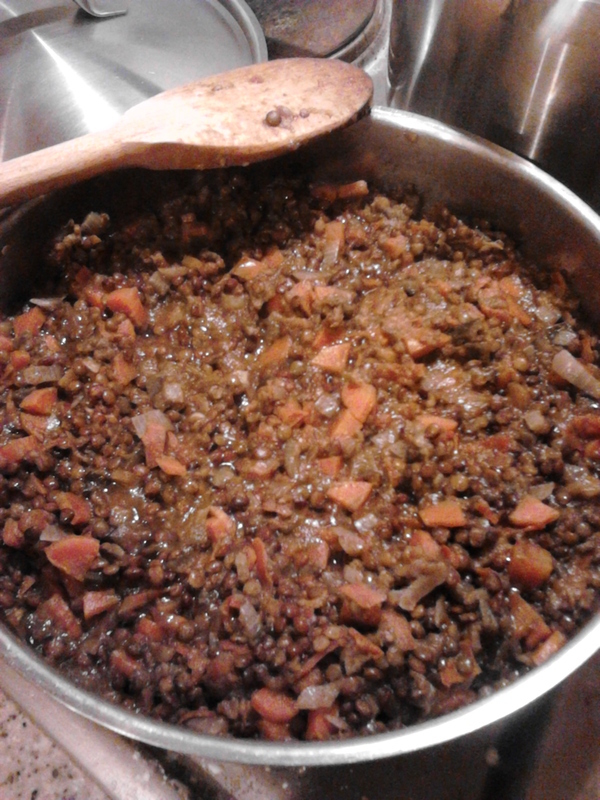 Reduce to a simmer and cook, with a spoon in the pan to hold the lid ‘ajar’, for 30 mins until the lentils can be squashed with the back of your spoon. In a microwave-safe jug or bowl, mix cornflour with a little milk until smooth, and then add the rest and mix well. 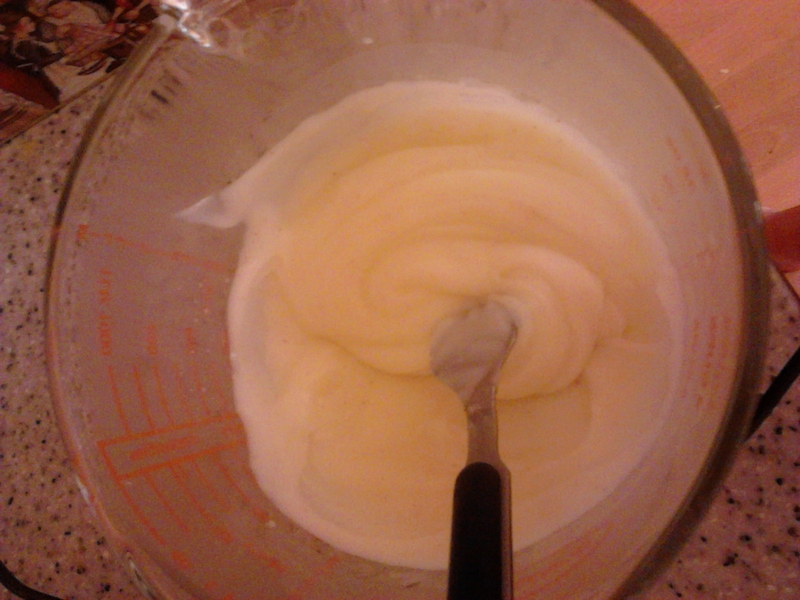 Microwave on high in 30 sec bursts, whisking in between times, until it thickens to something like single cream. Add cheese, salt and pepper to taste, and a dusting of nutmeg and mix well. It needs to be fairly liquid, as you will be cooking the lasagne sheets and they need water to soften. If it looks too thick, thin it with water or milk. 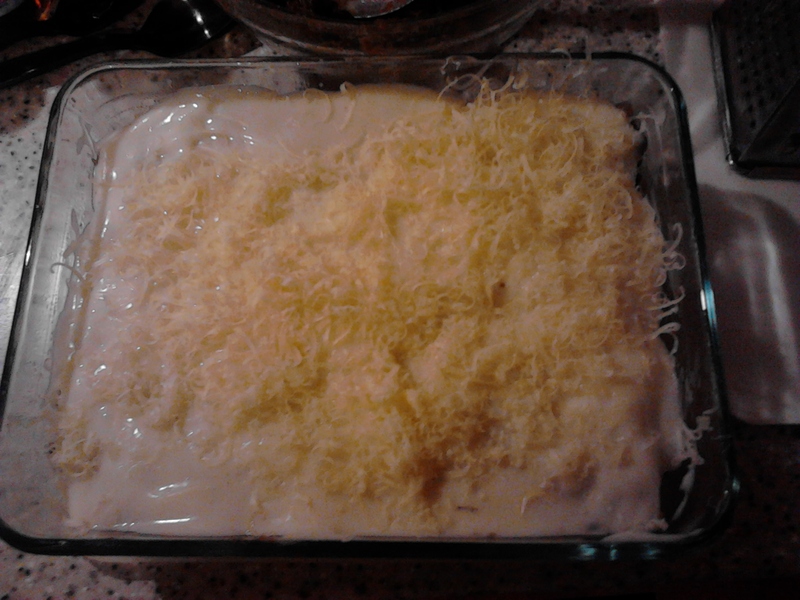 To make the lasagne, layer pasta sheets, filling and white sauce alternately until the very last layer, when you just put pasta and white sauce with a sprinkling of grated cheese if you have it to spare. The white sauce in this picture was too thick, and I ended up having to add milk after I’d assembled the lasagne, which was a complete faff and didn’t work all that well…. Either bake in a 180C oven for 30 mins until hot, or cover and microwave on medium for 10-ish minutes until piping hot and the pasta is soft and well cooked. You’ll need to experiment with times, and may want to pre soak the lasagne sheets as I often find they stay a bit on the dry side. The lasagne also freezes very well before final cooking. It will cook best if you allow it to defrost fully in the fridge before baking. In a microwave-safe jug or bowl, mix cornflour with a little milk until smooth, and then add the rest and mix well. Microwave on high in 30 sec bursts, whisking in between times, until it thickens to something like wallpaper paste (yummy!). Add cheese, salt and pepper to taste, and a dusting of nutmeg and mix well. To make the pasty filling, mix an equal quantity of lasagne filling with the white sauce, and allow it to cool fully. 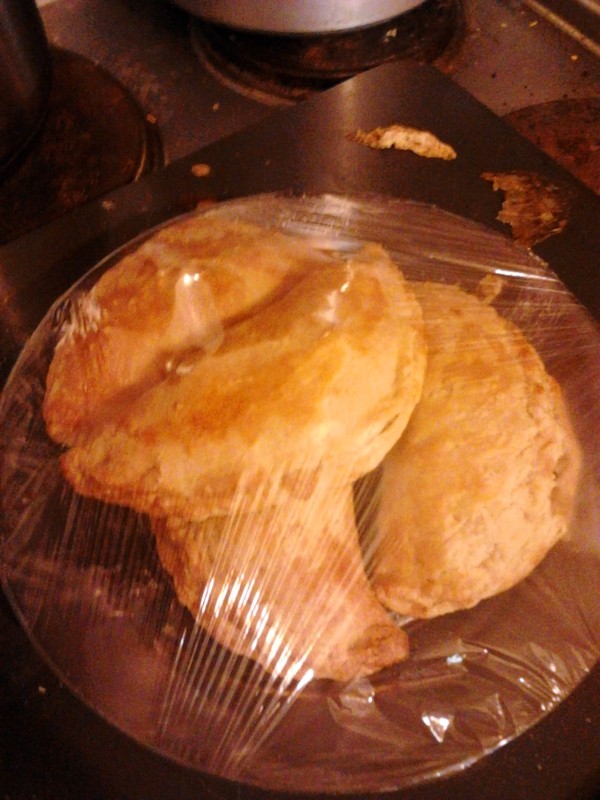 Then put a couple of spoonsful on your pastry circles, seal up the pasties, and bake as per Elaine’s instructions. I get a lot of my ingredients from Approved Foods who specialise in short-dated and just-past-best-before-date food.